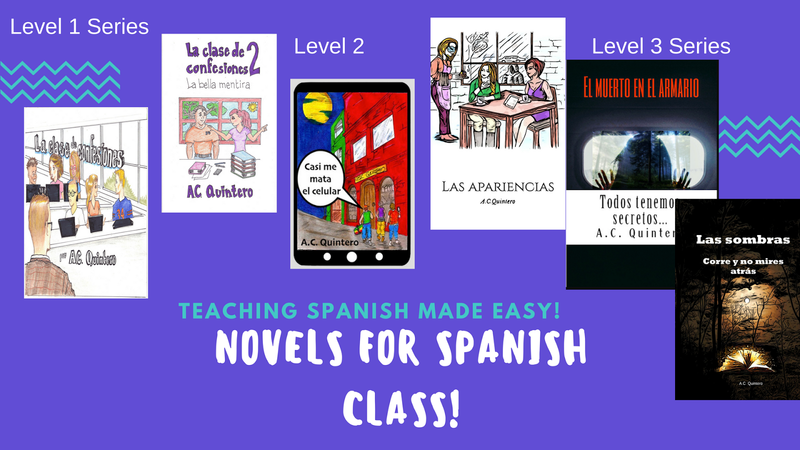 Teaching Spanish Made Easy : Redefine your first weeks of Spanish class, and beyond! 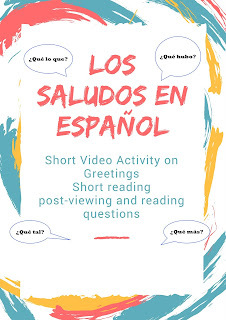 Redefine your first weeks of Spanish class, and beyond! This week I decided to change things up a bit. This was my second week of classes, and I wanted to immerse my students as much as possible to the wonderful world of language. One of the limitations we may have in doing that in the lower-levels, is the lack of vocabulary and familiarity with Spanish. 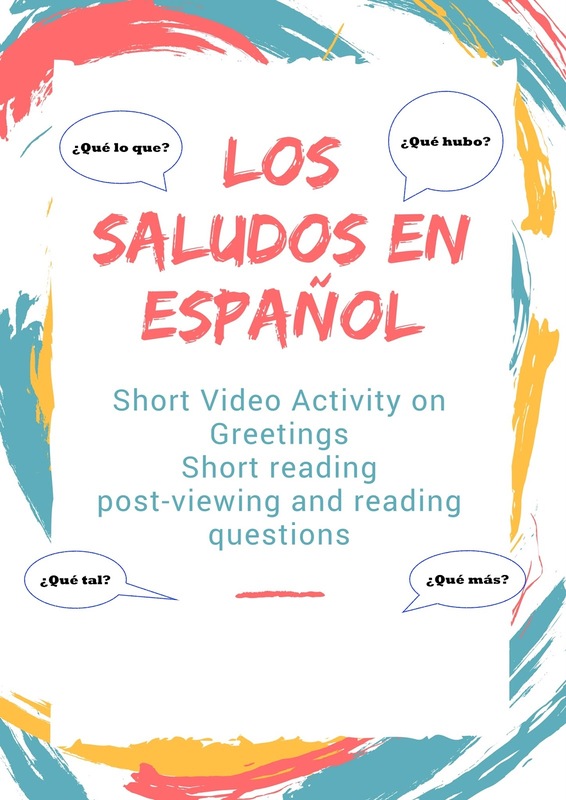 That's where this amazing Spanish video resource came in! You may also want to check out: 5 ways to get students talking from day 1! 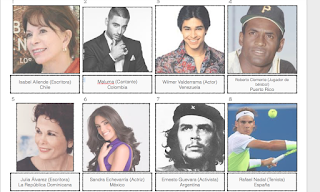 This post will feature two activities that I have created around the use of basic level 1 Spanish. I struggled with teaching the first month of Spanish so I am really digging deep to make the experience as much as enjoyable as intellectually stimulating. The activities are designed to give students exposure to a wide range of simplified input that ties into the cultures of Latin America. I found this great video about greetings and leave-takings in Spanish (Spanish in a Flash produced it). 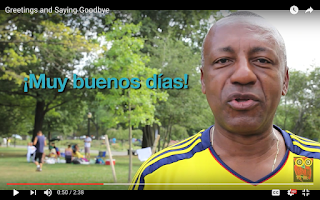 In this video, they interview a host of Spanish-speakers from different parts of Latin America. These people share what a typical greeting is like in their country. They are authentic, animated and of course natural in their sharing. The activity for this resource features a short reading with vocabulary, pictures of the speakers, and multiple-choice options based on their responses. We had a very good discussion, on why there are so many greetings (which are addressed in the one-page guidance notes, and in the short reading). *I learned some new one from La República Dominicana. ¿Qué es lo que? How am I using this resource? I asked them to share "observaciones." Most shared that there were may different ways to say "hi" or "how are you doing." I engaged them in a conversation as to why that is, and then gave them examples of how we say "hi" in the US. They watched a second time and third time, connecting the people with the greetings. *First, I had students choose three of the greetings and go around class to greet three students. They was energetic and fun! *Second, I had them create a dialogue (very basic) introducing themselves to other classmates. This was not memorized, and it was a lot of fun! Students added their own rejoinders (Spanish 1! ), and they got a chance to introduce their classmates. Most importantly, they included some of these authentic expressions! My journey this year to redefine the beginning of the year. If you have any suggestions or activity, please comment below and add your website. This year, I am bent on redefining how I teach the first few weeks. I was very inspired by Spanish Mama's blog in her first two weeks of teaching Spanish. She mentioned how she was developing and formulated a new philosophy of teaching; something that I am journeying on as well. I admit that I have not been as motivated in the past to teach the basic tenets of Spanish because I am super passionate about teaching my school unit, my sports unit and my problem-based travel to Spain unit. But, I realize the importance of the first few weeks so this year I am committed to giving it some my best and just having fun. Here is one of the activities I came up with the practice the verb Ser. Each student receives a card with the name and picture of a Hispanic person. I limited it to a few professions. You will notice that some people were born here but have family roots in Latin America. Students will study their card for two minutes after which they will get up to introduce themselves as that person.